The United States Mint has been minting proof coins since the very early years of its existence. The first proof coins minted were 1801 silver dollars. Proof coins minted today all have a frosted cameo finish on the devices and a highly mirrored field. Modern technology has ensured that almost every one of them is a perfect coin. Unfortunately, classic proof coins minted from 1801 through 1917 were not minted with today's modern technology that yielded nearly perfect coins every time. Surface preservation is the assessment of damage and imperfections on the surface of the coin since it was minted. Early proof coins were minted in small quantities and were occasionally stacked on tables before they were distributed. This led to small nicks or scratches also known as bag marks. Collectors of proof coins stored their coins in coin cabinets with felt lined drawers with indentations to hold the coins. When the drawer was opened and closed, the coins would slide across the surface of the drawer. This action would result in hairlines being left on the surface of the coin. Also, coin albums with plastic inserts would slide across the surface of the coin and also leave marks or light scratches. Additionally, there was a time when it was acceptable practice to clean your coins regularly. This is now frowned upon in the world of coin collecting. 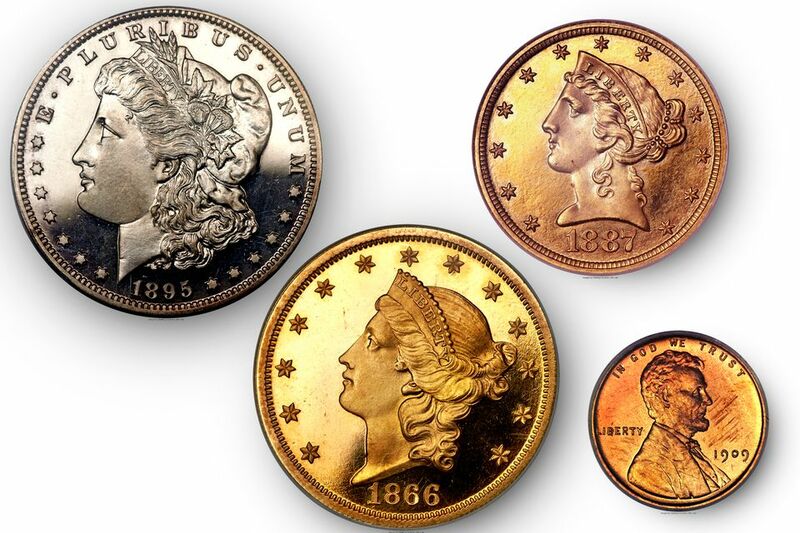 Proof coins are struck multiple times in order to bring up the finest detail on the coins. Since great care was taken to strike these coins, die alignment and striking pressure was almost always optimal. Additionally, very small mintages (usually between 100 and 1,000 coins) meant that die wear was usually nonexistent. Therefore, details were sharp and most specimens had frosted devices with a mirrored field. The manufacturing process of proof coins included the special preparation of the dies and polishing of the planchets to remove imperfections on the surface of the metal before striking. This use of high quality dies and planchets meant that little or no cartwheel effect existed on early proof coins. However a few matte or satin finish proof coins were minted between 1908 and 1916. These included Lincoln cents, Buffalo Nickels and some gold coins. These coins did not have the mirrored fields and therefore yielded a luster or cartwheel finish to the surface of the coins. Eye appeal is the overall appearance of a coin. Some coins can be very pleasing and beautiful while other coins of the same grade can be ugly or distracting. This usually only applies to copper and silver proof coins that can tone very easily. The toning on coins can be colorful and enhance the beauty of the coin or it can be dark and ugly that detract from its beauty. The more beautiful the toning is, the more positive effect it will have on a coin's grade. By definition, proof coins are specially minted coins for collectors. However, there have been a few proof only issues of coins that ended up in circulation. Classic Proof coins that did enter circulation and saw a considerable amount of use resulted in well-worn coins. If there were coins of the same type and date made for circulation, it is sometimes impossible to tell the difference between the circulation strike and the proof strike. There are certain coin types and date combinations that were only struck for collectors in Proof. Therefore, these coins, even though well circulated, are known to be proof coins since only Proof coins were struck. Coins in this grade range have heavy hairlines and some bag marks from improper cleaning and handling. They may also have a cloudy surface due to improper storage. The reflective surfaces in the field usually accentuate these hairlines and make them more distracting than if they were on coins minted for regular circulation. Additionally, they may have some unattractive toning, spots and fingerprints on the surface of the coin. Coins in the mid-range will have lighter hairlines and tiny marks from improper handling. Small spots and light fingerprints are acceptable as long as they do not detract from the overall appearance of the coin. Small nicks and tiny scratches are acceptable and some light hairlines in the reflective fields can be tolerated. High Grade early classic proof coins will have very few marks and hairlines and they will not reside in the prime focal areas of the coin. These imperfections will not detract from the overall beauty of the coin. The reflective fields of the coin should be reasonably clean without distracting marks. The overall eye appeal should be outstanding for a coin in this grade. Given that most of these coins are over 100 years old, mishandling and improper storage seems to be their lot in life. Coupled with a minting technique that was not capable of yielding perfect coins, means that very few classic proof coins exist in these grades.